Busy work schedule? No problem. Onion Creek Kennels provides a safe, monitored and personalized environment for your dog to play with others. We provide a controlled and monitored environment, in which approved dogs can interact and play throughout the day. Convenient to the Buda, Driftwood, Kyle, Manchaca and South Austin areas, clients can drop off or pick up their their dogs Monday-Friday 7:00am-7:00pm. Saturday Daycare Hours 7:00am-5:00pm. 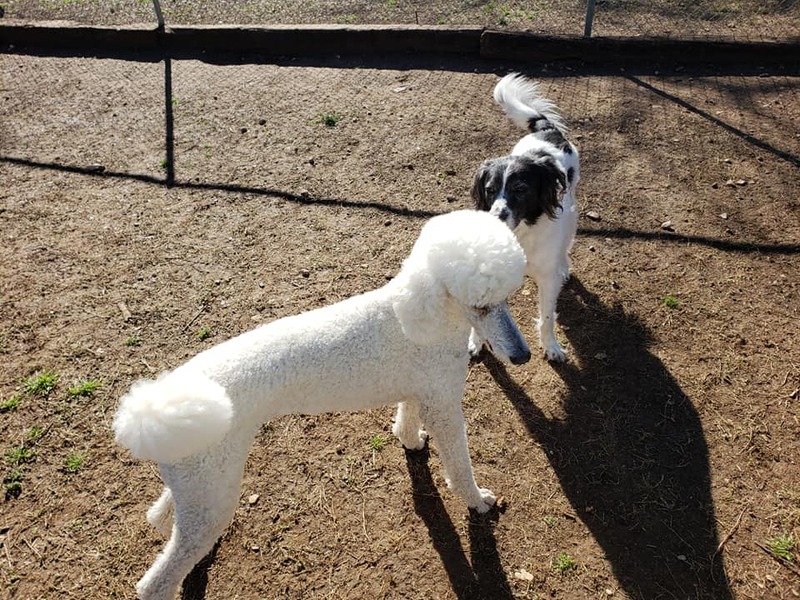 Group Play With Friends at Onion Creek Kennels includes romping across huge outdoor grass yards, splashing in wading pools, cuddles from our pet-loving team, and lots of toys! Our Group Play is structured and divided into playtime, training, cuddle time and rest time. Playgroups consist of 5 to 10 dogs matched by their size, energy levels, and play style. An Initial Evaluation is required prior to the first Group Play Session. We will do a thorough assessment of your dog and tell you whether or not our Group Play is a good fit for them. Any breed could be turned away for behavior reasons. Each dog is carefully evaluated on a continuous basis to ensure that everyone has a safe and positive experience. All dogs participating in playgroups must be spayed or neutered if they are over six months of age. Dog Daycare is $25.00 per dog. Discounted Dog Daycare Packages are available (10 Packs are $235 and 20 Packs are $440). Call us for more information.